Kṛṣṇa is the exalted Supreme entity having His eternal name, eternal form, eternal attribution and eternal pastimes. The very name "Kṛṣṇa" implies His love-attracting designation, expressing by His eternal nomenclature the acme of entity. His eternal beautiful heavenly blue-tinged body glowing with the intensity of ever-existing knowledge has a flute in both His hands. As His inconceivable spiritual energy is all-extending, still He maintains His all-charming medium size by His qualifying spiritual instrumentals. His all-accommodating supreme subjectivity is nicely manifested in His eternal form. The concentrated all-time presence, uncovered knowledge and inebriating felicity have their beauty in Him. The mundane manifestive portion of His own Self is known as all-pervading Paramātmā, Īśvara (Superior Lord) or Viṣṇu (All-fostering). Hence it is evident that Kṛṣṇa is sole Supreme Godhead. His unrivaled or unique spiritual body of superexcellent charm is eternally unveiled with innumerable spiritual instrumentals (senses) and unreckonable attributes keeping their signifying location properly, adjusting at the same time by His inconceivable conciliative powers. This beautiful spiritual figure is identical with Kṛṣṇa and the spiritual entity of Kṛṣṇa is identical with His own figure. The very intensely blended entity of eternal presence of felicitous cognition is the charming targeted holding or transcendental icon. It follows that the conception of the indistinguishable formless magnitude (Brahman) which is an indolent, lax, presentment of cognitive bliss, is merely a penumbra of intensely blended glow of the three concomitants, viz., the blissful, the substantive and the cognitive. This transcendental manifestive icon Kṛṣṇa in His original face is primordial background of magnitudinal infinite Brahman and of the all-pervasive oversoul. 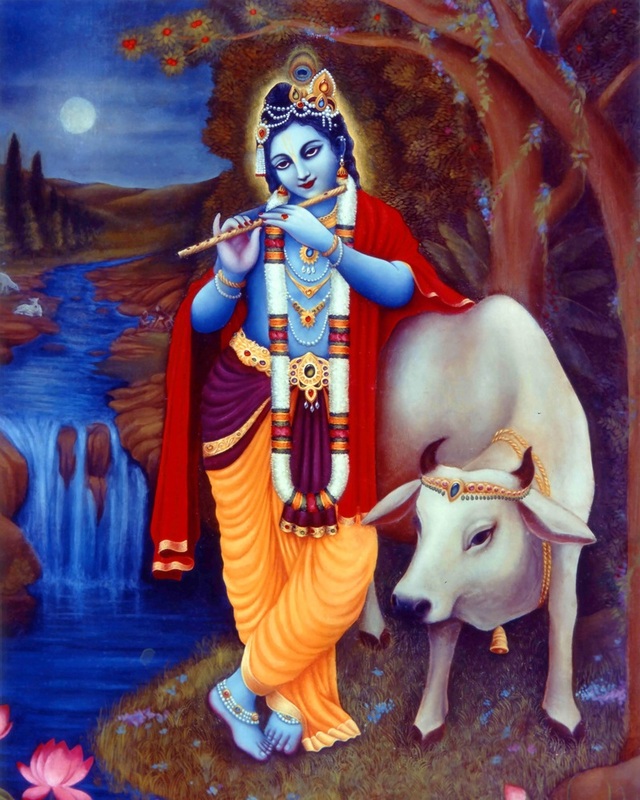 Kṛṣṇa as truly visioned in His variegated pastimes, such as owner of transcendental cows, chief of cowherds, consort of milk-maids, ruler of the terrestrial abode Gokula and object of worship by transcendental residents of Goloka beauties, is Govinda. He is the root cause of all causes who are the predominating and predominated agents of the universe. The glance of His projected fractional portion in the sacred originating water viz., the personal oversoul or Paramātmā, gives rise to a secondary potency-nature who creates this mundane universe. This oversoul's intermediate energy brings forth the individual souls analogously to the emanated rays of the sun. This book is a treatise of Kṛṣṇa; so the preamble is enacted by chanting His name in the beginning.